This WEB Fed Bag-in-Box (BIB) Filler is specially for filling spout-prepared bags with a wide range of liquids like drinking water, juice, milk, edible oil and beverage. 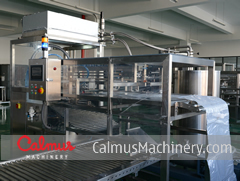 The filling machine features fully-automatic by employing PLC and touch screen control system. The whole process of cutting apart from the fed continuous bags, delivering empty bags to heads for decapping, nitrogen injection (optional), vacuumization (optional), filling, capping and transiting filled bags to the conveyor can be completed automatically, no human operation required. This Bag-in-Box Filler is designed with CIP (Clean-in-Place) function and circuit connection. 2. Easy to use. The touch-screen control system makes operation easy. 3. Self-test and protecting function. 4. An electromagnetic flow meter system employed improves filling precision and truly achieves the quantitative filling. 5. Grade 304 stainless steel body and 316L stainless fluid-contact parts. 6. Filling a different capacity bag acceptable only by changing the setting. 7. Perfect spout clamping system ensures realiable running of the machine and meanwhile no damage to the bag spout. 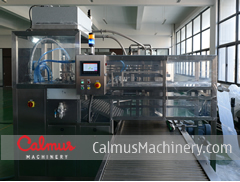 A Fully-automatic Bag-in-Box Packaging Line is also available and it is perfectly matched to this Bag-in-Box Filling Machine.